José Urias owns a construction company in suburban Boston, where he has lived since he was a teenager. This year, he and his wife had the “what if” talk: What will they do if they have to say goodbye to the life they’ve built? Urias, 40, and his wife are among the 195,000 Salvadorans who have lived in the U.S. since 2001 under Temporary Protected Status, or TPS, which granted temporary legal status to immigrants from certain countries fleeing natural disasters and civil wars. Through almost two decades, previous administrations from both parties have renewed the TPS status of tens of thousands of people, allowing them to establish themselves in the U.S. and grow generational roots. But the Trump administration said it would be ending TPS for a majority of recipients, which includes 200,000 Salvadorans, nearly 3,000 Nicaraguans, 57,000 Hondurans, 46,000 Haitians, and nearly 10,000 from Nepal and Sudan. Though courts have temporarily blocked the Trump administration from ending TPS for holders from El Salvador, Haiti, Nicaragua and Sudan, families from these countries still feel their lives are hanging by a thread. Urias said he and his wife have talked about what would happen to their three children, who are under 18 and were born in the U.S. Would they go with them to El Salvador or would they stay here? And if so, how? Urias said he prefers to not think too much about that. “The children are concerned because they don’t want to go to a country that they’ve never been to and don’t know," he said. "But I still feel we have time to do something before anything drastic happens." Urias and other TPS recipients said they are gearing up for an immigration march on Feb. 12 in Washington to push for a comprehensive immigration overhaul package that would grant them permanent legal status and lessen their fear of deportation. The Trump administration contends that the program is “temporary,” as its name says, and that conditions in the countries covered by TPS have improved enough for its residents to return there. But Honduras, El Salvador and Nicaragua are still raked by high levels of violence, poverty and political instability. Like Urias, César Salinas, 37, emigrated from El Salvador at 16. 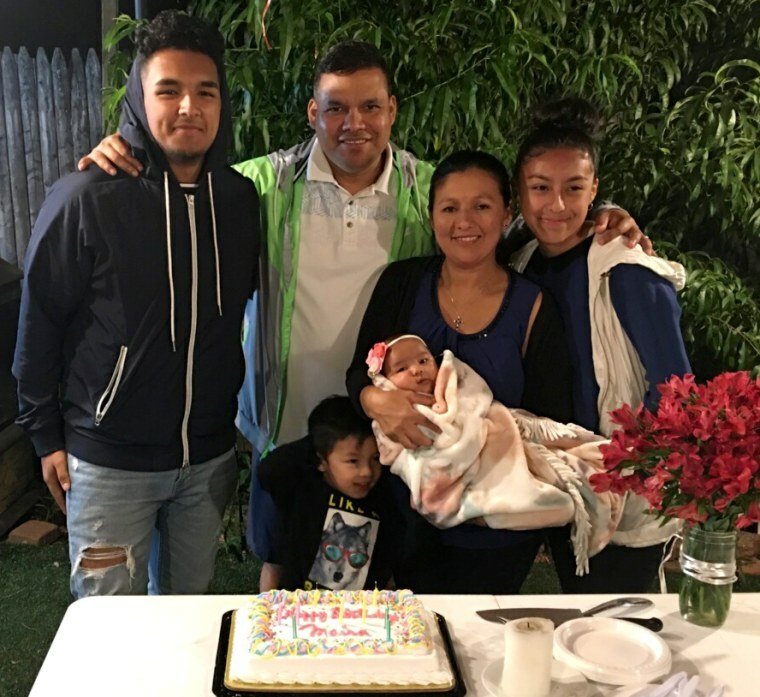 The scheduled cancellation of TPS next September has been very stressful for Salinas, a building superintendent on Long Island, New York, who is married and has three children who were born in the U.S.
“It’s been very hard — one has a whole life here in the States," said Salinas. "I own two homes, I pay taxes. I’ve invested in this country. I’m settled here. I have roots here," he said. "It’s real hard to hear that after all that they are canceling TPS." Salinas remains hopeful that legislators will listen to them, especially with a new Democratic majority in the House that is expected to be friendlier to their cause. “We are working real hard to lobby for legislation that will help us get legal permanent residency," Salinas said. "We've been visiting with legislators and we’re going back in February to D.C. to put more pressure on the lawmakers." Robert Remes, an immigration attorney in Washington, said lawyers and advocates are waiting to see what a Democratic House majority does come January. But he's also looking at several options for their TPS clients, such as an order that could stop a deportation if the deportee has minor children. “It’s not a guarantee," he told NBC News. "We’re telling them to be prepared for anything." Sen. Robert Menéndez, D-N.J., and Sen. Marco Rubio, R-Fla., recently introduced legislation that would seek to give Temporary Protected Status to eligible Venezuelans already living in the United States. “Granting this protection will provide a temporary solution to many Venezuelans who fear returning to their homeland due to the ongoing crisis and extraordinarily difficult conditions,” Rubio said in a statement. The Trump administration has not commented on that legislation but has said it would consider increasing the number of Venezuelans who are granted asylum. Since late summer, more than 28,000 Venezuelans requested asylum, and incoming Rep. Donna Shalala of Florida, a Democrat, has said that one of her top priorities will be TPS for Venezuela and for those from Central America. Some activists and family members hope that giving TPS status to Venezuelans would highlight the importance of the program to other immigrants. The varying TPS termination dates by country, pending court activity and potential congressional action is causing confusion for TPS recipients. Working Families United, a coalition of seven unions advocating for them, has created "TPS Answers," a Facebook Messenger tool to help answer questions and keep people up to date on activities, said B. Loewe, a spokesman for the group. "It's a lot of information to keep up with. People want to know, what does this mean for my driver's license? What does this mean for my work permit?" Loewe said. He said the hope is that recipients can get answers with one click and, if they need more, be able to talk to a live person via the Messenger tool. Community activists say they expect at least 5,000 people to show up for the Feb. 12 march and rally in Washington, where they also expect to meet with key members of Congress. “We have to fight for this, because if we stay quiet, the program gets canceled on the day the Trump administration set it," said José Palma, a Salvadoran-American TPS recipient who has been in the U.S. for over 20 years. "But if we fight to change, there is a possibility that we could get that change."